Through blind recruiting, Unitive counters unconscious bias and ensures that the best applicants are hired in a variety of positions. To address this issue, Unitive has developed a software recruiting platform to help companies to implement research-backed, blind recruitment practices. The software addresses the entire hiring process in which companies undertake the following steps: I) prioritize and commit to a set of job skills they are seeking in a position, II) write a job description and receive realtime feedback on how to ensure appeal to both male and female candidates, III) conduct blind resume reviews, IV) conduct structured interviews with pre-planning support and question suggestions, and V) engage in data-driven hiring. In addition to the platform, Unitive offers a variety of workshops on valued-based hiring. Unitive is addressing the problem of unconscious bias in recruitment. The recruiting platform is based on academic research showing that unconscious bias permeates almost every stage of the job selection process; from job descriptions that appeal more to men than women, to selection bias when reading resumes and making final hiring decisions. Due to unconscious bias, both the candidate and the hiring company suffer from not hiring the most qualified candidate. Unitive is rather unique among recruitment platforms as it engages customers by building a solid business case for blind recruiting. Unitive realized that while diversity and inclusion is always of interest, hiring managers are more concerned about talent and performance. 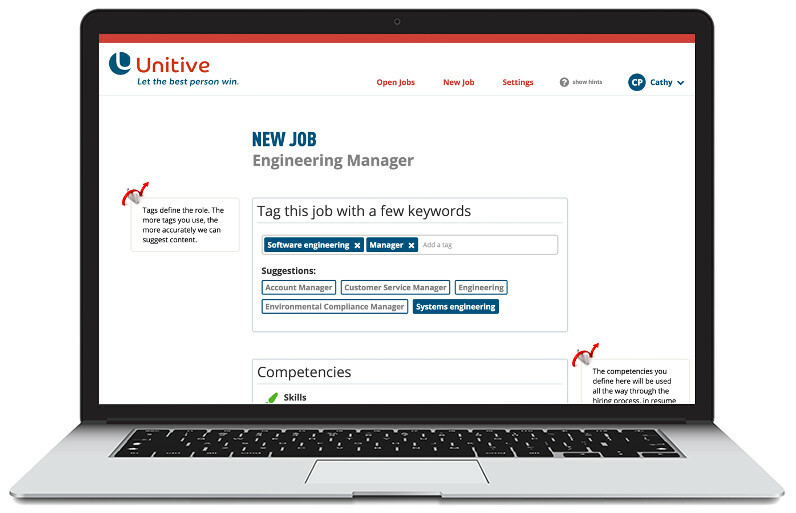 Unitive thus markets their software and services as a solution to build the best workforce, ensuring higher profits through a broader, more qualified pool of applicants, hiring of the best fitting talent, reduced attrition (due to better fit), faster hiring times and data on successful hires. Unitive started building the platform in 2015, and has experienced rapid growth since inception with their software currently used by hundreds of companies, from startups and tech companies to creative agencies. Unitive recently acquired a machine learning partner to improve its algorithms, and launched a mobile app companion to its Web platform. The company currently has four employees based in San Francisco. Unitive hopes to expand into professional development (hiring managers within firms) and retention services in the future.